It’s that time of year when Black Friday and Cyber Monday are just around the corner. There are tons of deals and shoppers out there, but it takes marketing magic to get more sales. We’ll be looking at what marketing tricks work, and what some of the world’s retail titans have done to promote their deals. Each year during Black Friday – Cyber Monday, consumer spending drastically spikes. According to the National Retail Federation, this year’s spending is expected to reach $718 billion, which is 4,8% more than in 2017. As for online sales, Adobe reported that Black Friday 2017 surpassed the $5 billion mark for the first time, setting a new sales record. Compared with 2016, that’s a 16.9% increase in dollars spent online. Similarly, Cyber Monday also breaks spending records every year, and figures show it’s the largest online sales day in US retail history for decade now. Each passing year BFCM’s popularity grows, spending increases, and everyone expects to find better deals. So we put together a list of our favorite promotions from previous years for you to use as inspiration for your own BFCM campaigns. Before diving into our list, we suggest watching this video for a quick refresher about Cyber Week and some must-try tips and tricks to experiment with this holiday season! 1. Apple, true to their form, went with a minimal, yet confident approach. Everyone knows Apple products are among the most coveted items for the holidays, meaning Apple can get away with putting a tiny little notice on their homepage. No explanation needed, the word Friday says it all. When you click it, you are displayed an inviting Apple Watch with a black screen and a text that, once again, says Friday. Say no more, Apple, we’ll be coming back for more. And on the big day itself, apple.com is as discreet as can be, except for the red banner on the bottom of the screen which leads us to an Apple Watch displaying a shopping list. Simple yet effective. Tip: If you can get away with it, less is more. For their worldwide Black Friday offer in 2016, 3. Asos decided to go with a catchy discount code – GOGOGO. That sounds like the unofficial motto of the whole Black Friday-Cyber Monday experience, so it’s extremely fitting. But to juxtapose this GOGOGO sentiment, they reassure their customers that the most intense day of shopping is a very chill experience with Asos. So, chill, type in your code, and get to gift shopping. A well-chosen pic on Instagram works wonders, too. 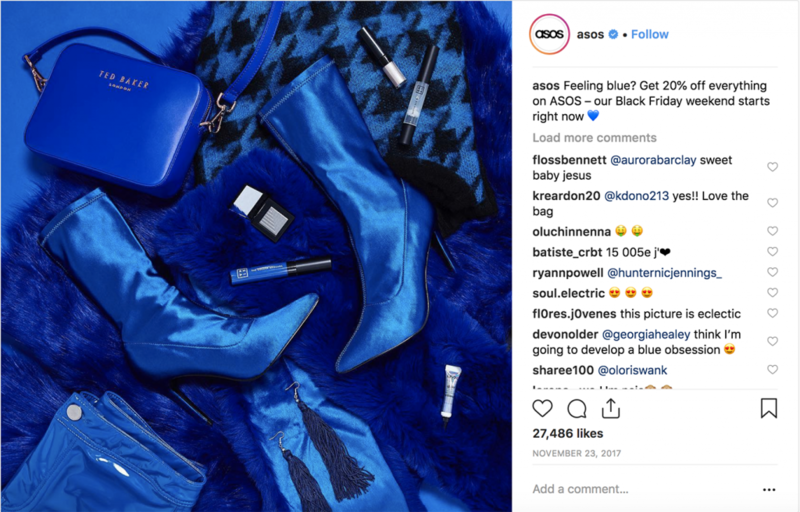 Just like last year, ASOS reminded everyone there’s no place for autumn blues. In the nick of time, to cheer us all up with the Black Friday-Cyber Monday weekend! You may have noticed that fashion stores and cosmetics brands (like 4. Karen Millen and 5. 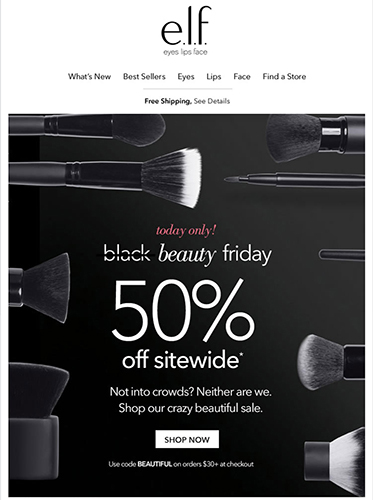 Elf Cosmetics) have the benefit of creating a particular theme for Black Friday, keeping it neat and black. To add a certain sense of exclusivity to your Cyber Monday Twitter post, take a look at 6. 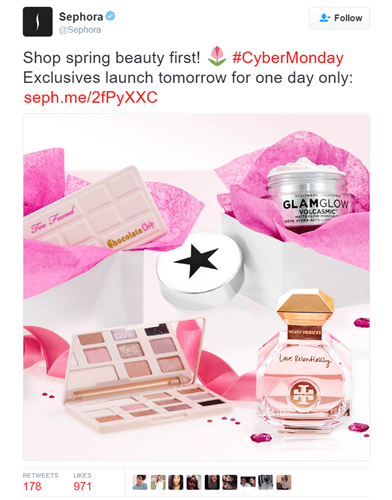 Sephora talking about spring way before anyone has gone shopping for their Christmas tree. 7. 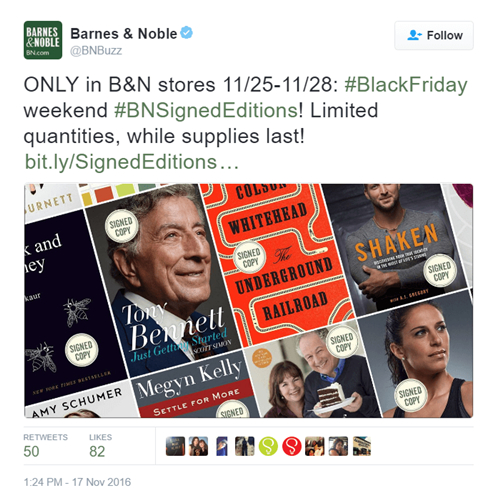 Barnes & Noble added an intriguing twist to their Black Friday experience by making the Black Friday weekend part of their Signed Editions campaign. A wonderful tactic, because the idea of getting your copies signed by the author generates more interest and makes the book a more personal gift. Tip: Your spin on Black Friday-Cyber Monday doesn’t have to be limited to sales and the holidays, think about what would make your customers happy. 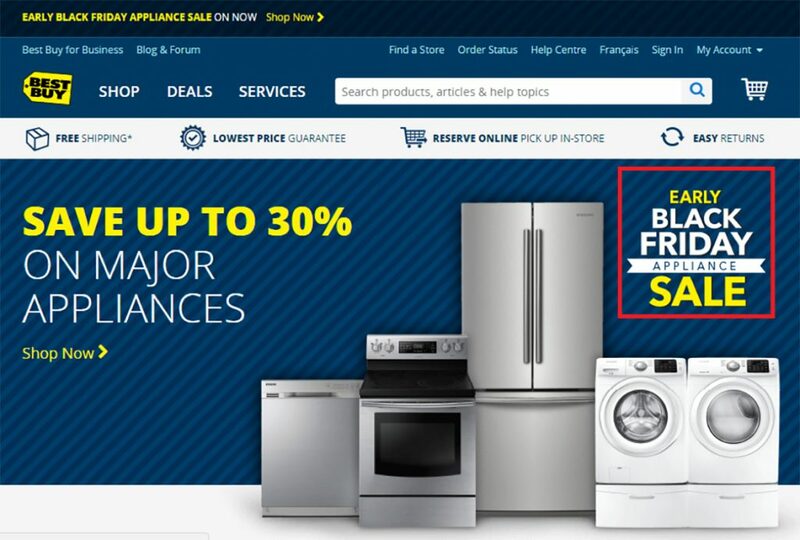 As Black Friday arrives, many appealing offers catch everyone’s eye. 8. 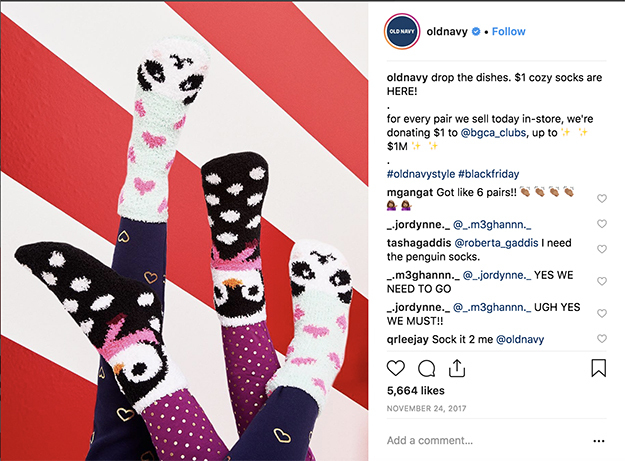 Old Navy took an alternative approach to donating part of their income to charity. Especially during the holiday season, consumers respond well to brands who give back. This deal was a definite win-win, doing something positive and building brand awareness. The right idea at the right time. Technology professionals at 9. Zapper found their way to users around the world by offering fast payments including QR codes. 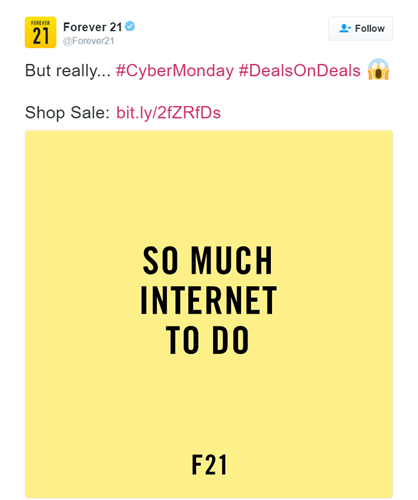 Putting this emerging technology to use seemed like a great idea for their Black Friday-Cyber Monday tweet too. Just like the majority of online merchants, you can make your website all about Black Friday-Cyber Monday. 10. Canon campaign banners came with a twist in 2016 – a slot-machine style section about the hottest deals. Pretty fun to watch, and you stick around a little longer to see just what those hot deals are. 11. Crocs created a pretty marvelous Black Friday headline by using their brand image to create the slogan “Add color to Black Friday”. What adds extra charm to the 12. Staples campaigns are the details, in this case, the titles for the product categories. You can already hear that tune inside of your head, can’t you? Tip: When it comes to marketing, language is one of the strongest weapons in your arsenal, don’t be afraid to use it. 13. Gap made their online campaign more holiday-oriented, inviting customers to make the association with holiday spirit and look at this shopping-fuelled couple of days as the perfect time to find that perfect gift. The play on words with the percentages is a nice touch. 14. Lenovo didn’t mention words like Black or Friday at all. Instead, they fully embraced the holiday mood and added a sense of urgency by adding a countdown clock. If that doesn’t get you buying laptops, nothing will. One of the giants in the home improvement supply business, 15. Home Depot, didn’t hesitate to remind everyone that they’re the best. So for them, Black Friday-Cyber Monday is, too, business as usual. As you can tell by their website, they’re all about savings. Tip: The whole idea behind Black Friday-Cyber Monday is smart holiday gift shopping. However, a 50-50 combination of holidays and savings can be bland, so it’s best to tip the scales a little. A good practice from 16. 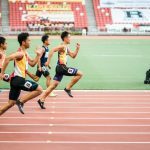 Levi’s – they haven’t forgotten that Black Friday-Cyber Monday is just once a year and that growing their subscriber list is a something that will remain a constant priority. So before taking a look at their sweet deals, they ask you to become a subscriber. Tip: The cool thing about Levi’s Black Friday offer was free shipping – now that’s a perk that always keeps people coming back for more. A bit of (black) humor is always a good way of attracting people’s attention. South Africa’s deals site 17. 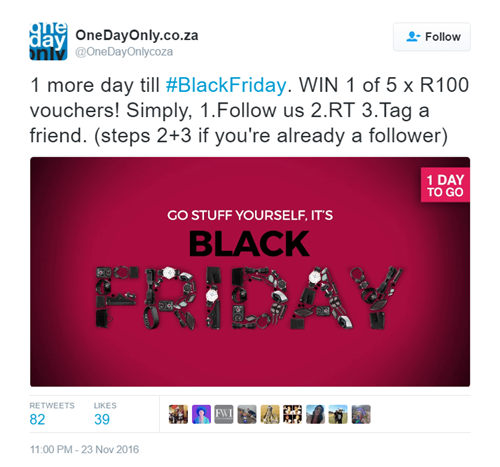 OneDayOnly.co.za embraced the Black Friday-Cyber Monday mentality to the fullest – the words speak for themselves. Those working in retail know that this is the busiest time of the year from everyone in manufacturing to the folks in customer support. So here’s a clever way of showing your customers that everything’s going to be a-ok, courtesy of 18. Shopify. Whereas 20. 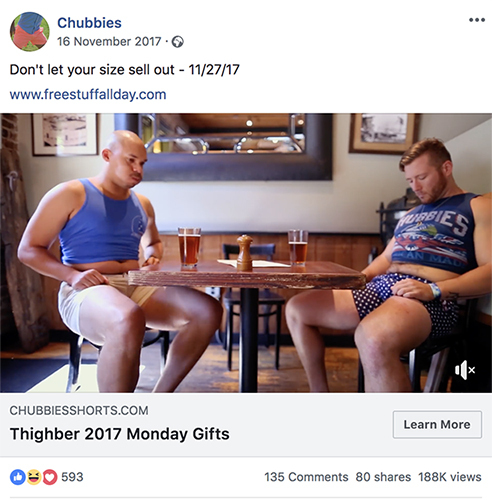 Chubbies took the humorous route and a week before Cyber Monday posted hilarious videos, introducing their Thighber Monday’s “Free gifts every hour” deal. Take it or leave it – or come back every hour to enlighten your curiosity. Tip: Creating content that gets a giggle out of your customers is a great way of gaining likes and shares on social media and building brand awareness. 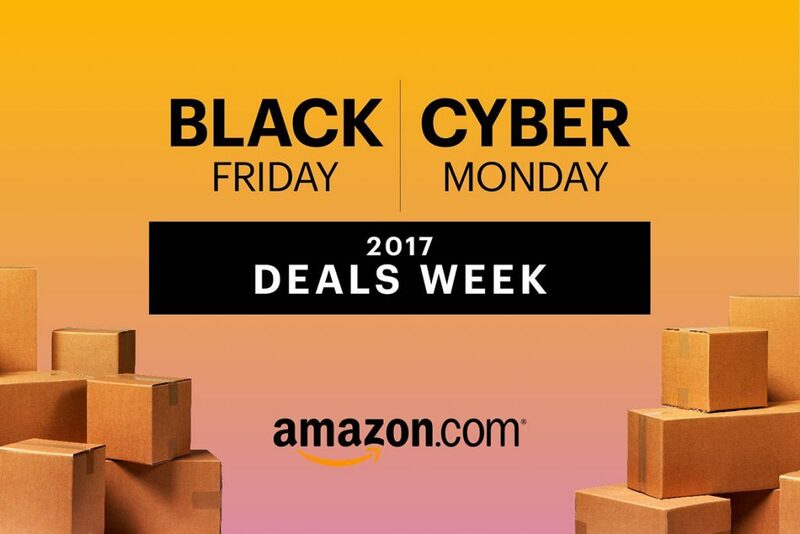 For many, the holiday shopping experience is extended into Cyber Week, with Black Friday and Cyber Monday being the two peaks. 21. Amazon is one of the prime examples. To make shoppers come back for more, for the last few years they have created a Deals of the Day segment split up into Available and Missed, a good little trick to create a sense of urgency. 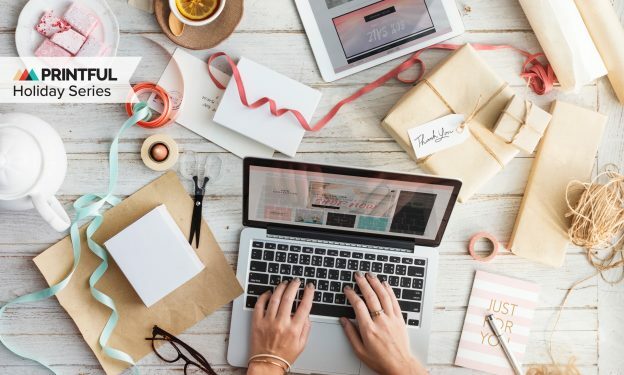 It’s a great idea to add some additional information to make the buyer more aware of what to expect, including tips on how to prepare for Cyber Monday. All this can be combined with a pretty profound list of CTAs or an exclusive newsletter encouraging shoppers to engage with them, whether it’s following on social media or downloading an app. On Amazon’s Twitter we saw that it doesn’t have to be about getting the biggest flat screen you see. 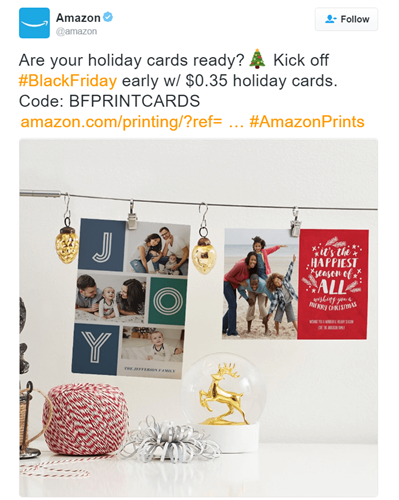 You can also use Cyber Week to showcase the little things, which makes their holiday card offer a particularly cute touch in preparation for the upcoming holiday mayhem. Sites like Amazon wouldn’t be what they are without thoroughness. 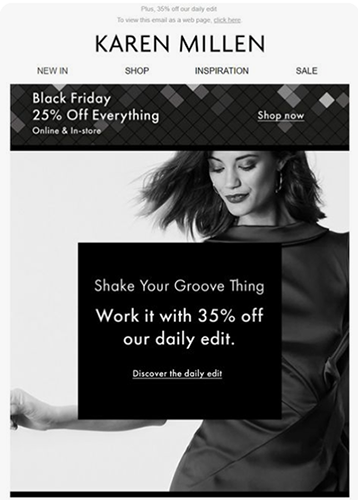 Like for most retailers, all of their on-site and social media activity was amplified by email campaigns urging users not to miss any deals. 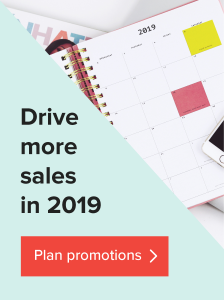 A great marketing idea to draw in more customers and sales is extending your holiday deals, like 22. Best Buy did. Not only will customers come back during the holiday weekend, but a part of them will also take their chance to shop before Black Friday or Cyber Monday have even arrived. 23. 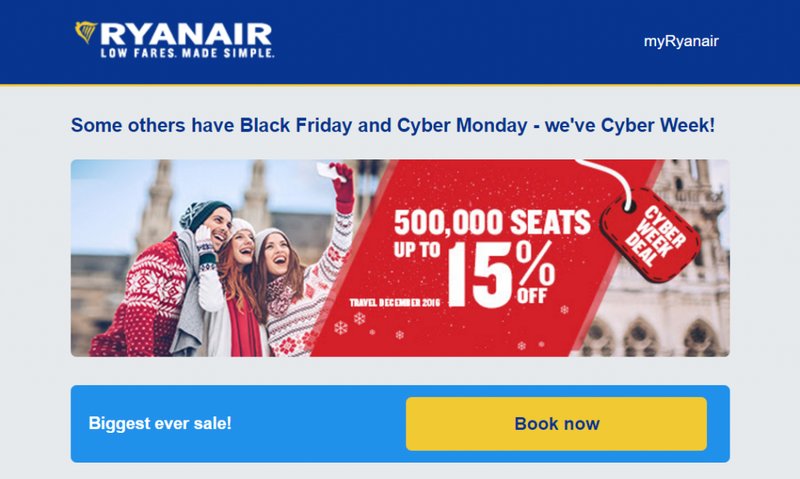 Ryanair also took pride in the fact that they offer their customers a week of deals, not just two or three days. Good call, because people can never get enough of good travel deals. A week-long deals extravaganza was also offered to 24. 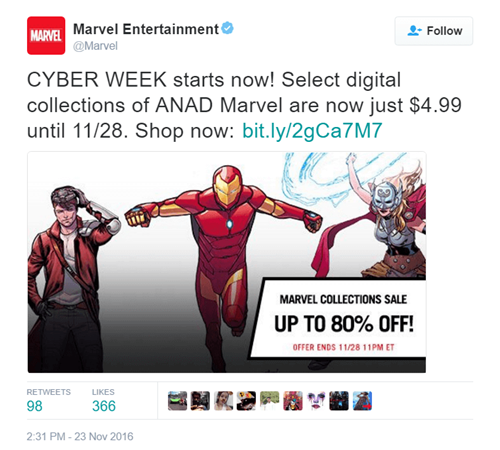 Marvel fans, including an aptly designed Cyber Monday campaign in 2016. Tip: Cyber Week is not for the faint of heart, make sure you are prepared for an intense week of sales and promotion. It turns out you don’t have to sell a thing to be a part of the Black Friday craze. This is what 25. PC Mag did to attract of tech-thirsty shoppers searching the internet for the best deals– simply add your email and you’ve got the promise of a new laptop for Christmas in the palm of your hand. 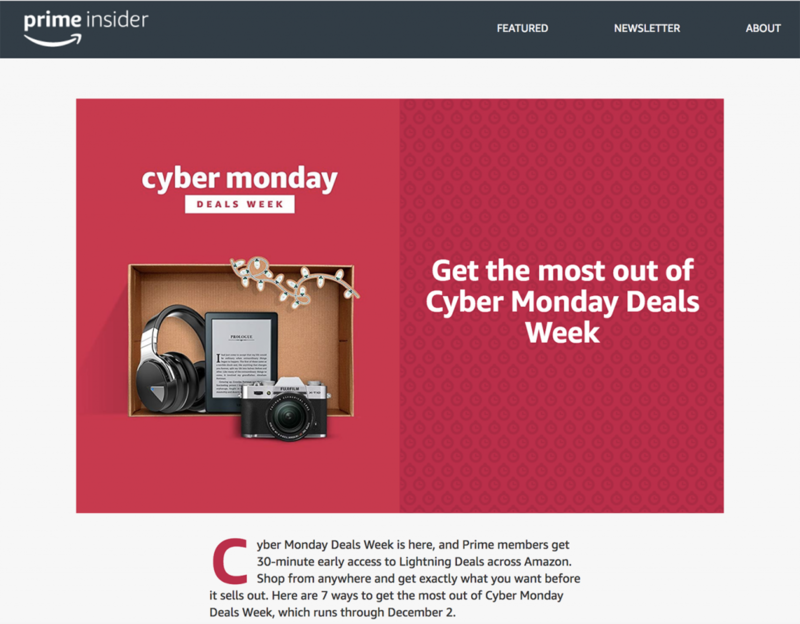 Sometimes there isn’t any particular buzz around Black Friday-Cyber Monday deals generated by retailers. But 26. 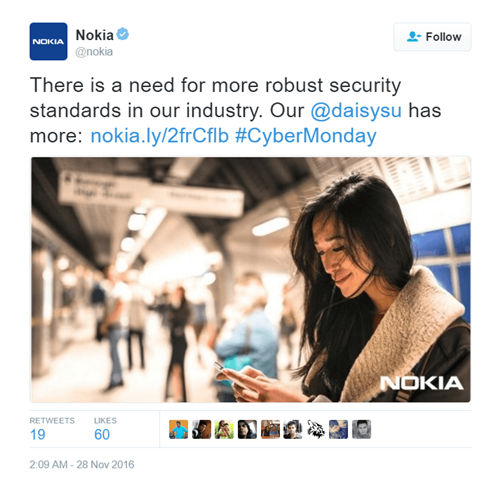 Nokia gave a good example of how to make your mark without selling anything, that is, posting information that shoppers will find useful. As an ecommerce platform, 27. 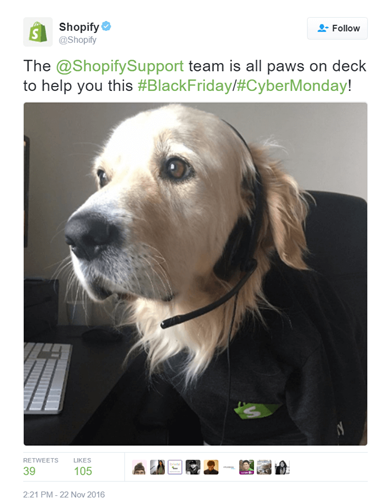 Shopify might not necessarily have any deals, but they’re supporting their customers that do. To show their existing and potential users what Black Friday-Cyber Monday is all about, they put up a real-time tracker of the sales made on Shopify from Friday till Monday. 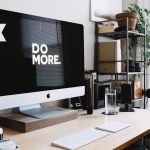 For one thing, it looks cool, and it’s also a good boost for all those on the fence about launching their online business. Tip: As they say, the best things in life are free. Use the opportunity to share your knowledge with overwhelmed shoppers and gain a few popularity points along the way. 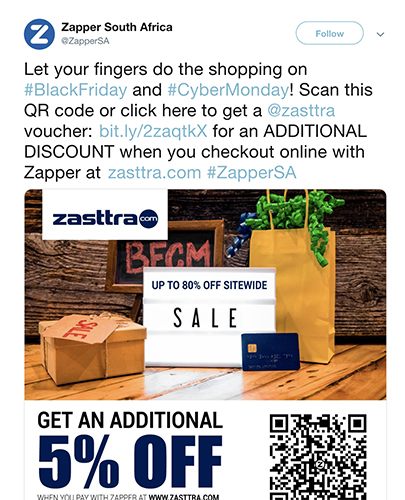 Once you’re set on your angle, the next step is to decide how to customize your campaign so you can successfully incorporate your product or service into the context of Black Friday-Cyber Monday. Here, you’ll be thinking about your target audience and how you’re going to appeal to them. And not only in terms of the deals themselves, but also their presentation – from enticing copy to eye-catching visuals. Whether your customers are more traditional or like to be surprised, you have to make your customers feel that you as a business have done your homework. Black Friday-Cyber Monday is a wildly anticipated time of the year that’s specifically crafted for shopping, so everything needs to go as smoothly as possible. 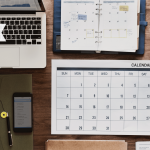 Doing marketing campaign overviews and lists of what’s working can prove to be very useful, but if you haven’t got the time for it, or you simply need a little marketing inspiration – be sure to check our complete Holiday Marketing Guide. 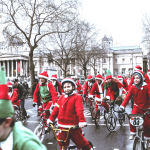 You’ll learn everything you need to know to get through a successful holiday season. This article was originally published in November 2016; it has since been updated. Fantastic article thank you Marianna! Epic Post! Lots of great information about marketing on BF/CM! We put a heavy focus on social media marketing during black friday and cyber monday – we see increased revenues when we have a plan of attack!